A new study published within the Journal of Bone & Joint Surgery has provided an insight into the challenge inherent in the treatment of rotator cuff tears. It was discovered that stem cells within the rotator cuff more frequently turn into fat cells, rather than muscle cells in the event of a tear. 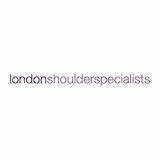 Here, weâ&#x20AC;&#x2122;ll analyse the findings and what it means for the future treatment of rotator cuff tears. 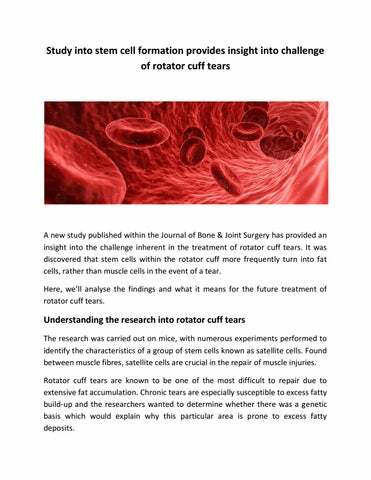 Understanding the research into rotator cuff tears The research was carried out on mice, with numerous experiments performed to identify the characteristics of a group of stem cells known as satellite cells. Found between muscle fibres, satellite cells are crucial in the repair of muscle injuries. Rotator cuff tears are known to be one of the most difficult to repair due to extensive fat accumulation. Chronic tears are especially susceptible to excess fatty build-up and the researchers wanted to determine whether there was a genetic basis which would explain why this particular area is prone to excess fatty deposits. The researchers carried out DNA-level studies. These managed to identify hundreds of differing gene activations in comparison to the stem cells in calf muscles. It was discovered that the stem cells within the shoulder were programmed to develop into fat cells more easily than those in the calf muscles. It was also discovered that rotator cuff stem cells were 23% less likely to develop into muscle cells. Why does it matter? This study is the first of its kind to assess the DNA modification of rotator cuff disease. At present, rotator cuff tears can be notoriously difficult to treat. This is largely down to the fact that there is excess fatty build-up surrounding the muscles. Therefore, researching into why this occurs is crucial for the development of more effective treatments. The researchers claim this study has opened the doors for a lot of additional studies. It shows that through further studies, newer, more effective clinical and therapeutic treatments could be developed. This would prove revolutionary for patients suffering from rotator cuff tears in the future.